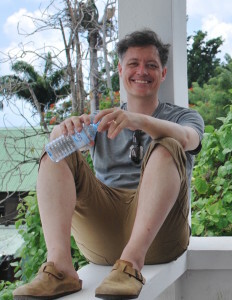 Robert Thorogood is the writer and creator of BBC1’s ‘Death in Paradise’. Robert went to Uppingham School before going on to Cambridge University, where he was President of the Cambridge Footlights. When he left, he spent many years working as an actor, writer and temporary secretary (only one of those jobs provided any kind of income stream). But he kept plugging away, and in 2008, Robert came up with the idea of a light-hearted murder mystery show set in the Caribbean. He then spent the next few years hawking his ‘Untitled Copper in St. Lucia idea’ to production companies around London until he managed to sell it to the BBC. Series 6 of ‘Death in Paradise’ went out earlier this year and was watched by an average of 8.5m people per episode, and the show is sold to 250+ territories worldwide.